Payal Khandwala describes her new pret offering this season is the second part of our Indessential trilogy and as always, an extension of what we believe in. Her new collection focused on women those care more about personal style than fashion. For this reason, her clothes are not inspired by the past, most certainly not by fashion and especially not by trends. The idea has always been, to pen a vocabulary that is relevant now and one that can become a reference for the future. The hope is that the clothes she proposes will transcend seasons because the language is distinct, and the signature authentic. She choses to design minimal and easy, layered separates because this is what I like to wear, and each time I style a collection it is an insight into how I would put these different components together. She further describes: As our clothes are not a result of a curated team of creative directors, designers, and stylists, the garments remain a cohesive extension of one design voice; mine. This makes everything consistent and therefore, also ageless. Which in my opinion is paramount, as this element alone allows us to slow fashion just a little bit. If we can suggest clothes that are pertinent now and in the future then we can wear them for longer, as staples, and team them with what we already have in our closets. This way we can have our wardrobes evolve seamlessly. We must repeat, reuse, and re-wear. To me this is the ideal way to be truly sustainable, to be able to buy less but buy better, to wear with care and for longer, to reduce how much we waste and reconsider how we shop. 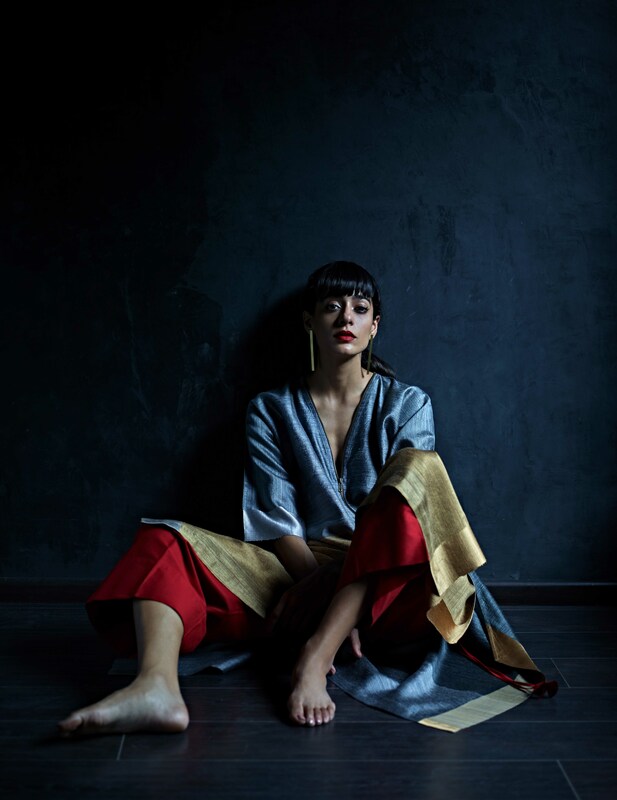 In an effort to do this, apart from her color-blocked silhouettes in our signature shapes, she also redesigned some of these garments in textiles that were the building blocks for her line of Saris and Little Saris, which was recently released. 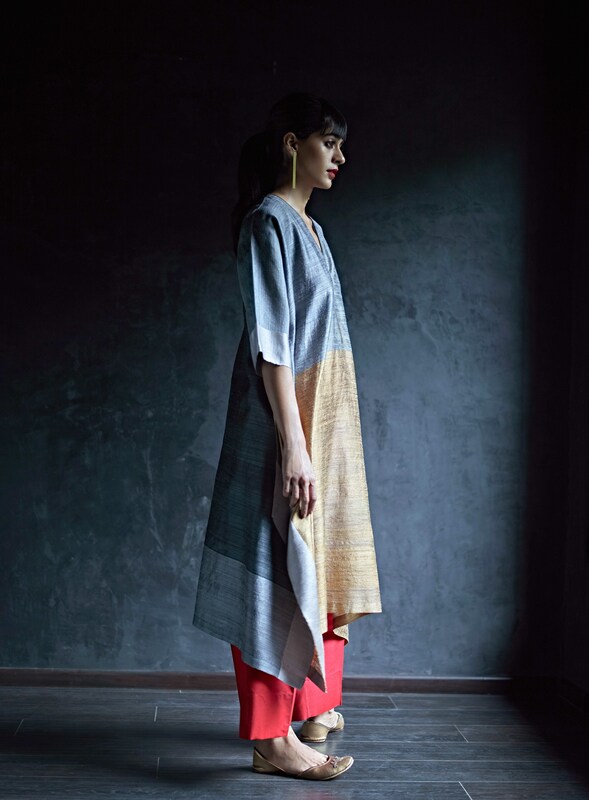 This season she has also launched an extensive range of handwoven dupattas. All the hand-woven silks, linens, and brocades are crafted by our artisans in Bhagalpur, West Bengal, and Benaras. 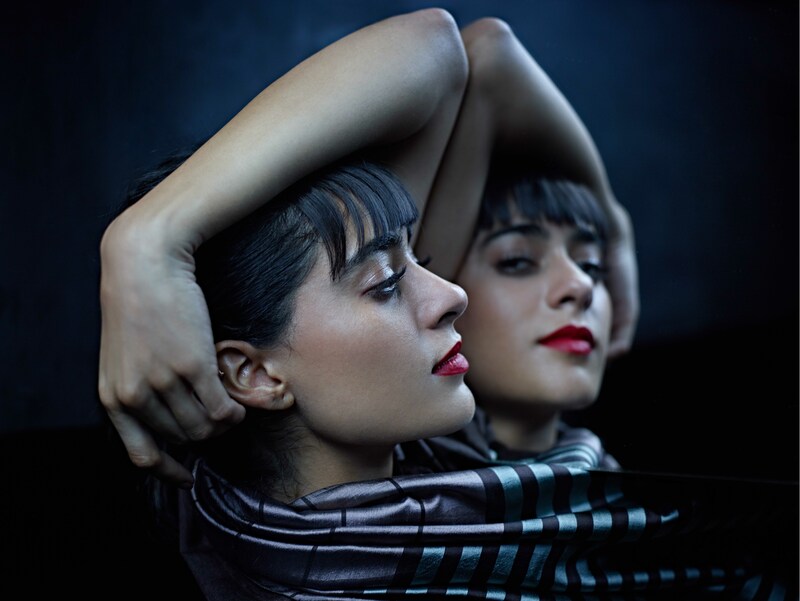 Her label is deeply rooted in an aesthetic that is Indian, but its spirit rises above our obvious cultural trappings. The aim was to try and redefine Indian essentials our way, in an effort to make them the voice of a new India. This time, Barnett Newman’s oil paintings with his minimalist approach to large color fields, interrupted by lines, (he called them zips) that divide and unite the canvas at the same time, was the perfect place to start. The rhythm and repetition of the lines, thin and thick helped me experiment with our palette in a way that impressionists did with pigment. Using color theory, I rearranged them to vibrate, compelling the eye to read, the illusion of a third color. 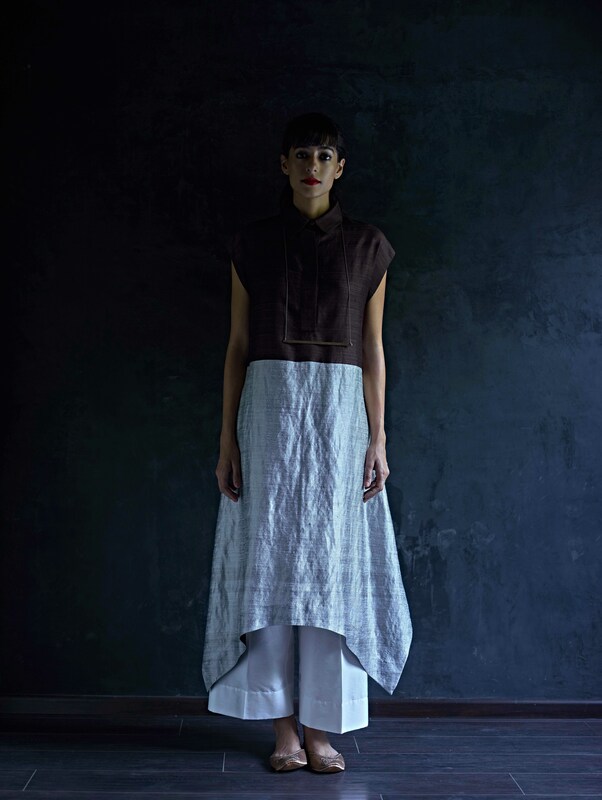 Payal Khandwala collection echoes with the current consumer trend where they look for ease and comfort. As we can witness her silhouettes are bringing the ease and loose fit through the use of natural fibers- prominently cotton.